With Sketch version 43, Bohemian Coding quietly announced – a revised file format. Behold. They introduced a new file format that allows reading and writing .sketch files manually or programmatically and go from Sketch straight to implementation. What does that mean for our workflow? Sketch had a file format that was workable not only from the design side but developer side too. An unzipped Sketch file created .png preview and human-readable .json files. This created a question for us – could our design and development teams collaborate seamlessly? Are we finally to feed design assets directly to the development pipeline and integrate .sketch file at the same time as development? By having similar repositories we could both edit the same designs. That could be any element, modular component or an entire screen UI. Anything visual can now go back and forth between Sketch and UI frontend seamlessly – in theory. What does that mean for us? We’d have to apply distributed version control to support this new, high-level way of collaborating not only within our design team but with developers outside the team as well to create a safe and responsible environment for project development. We also needed to find a way of knowing which one of us made changes, when they were made and if we can roll back to them. Seeing visually what these changes would be an added bonus. Just a side note, all of this also meant that documents created with Sketch 43 would not be compatible with previous versions. It was the quietest end of an era, perhaps for a reason. Talking to our backend developer and testing this new file format we found that this new Sketch format offers a different workflow, but it wasn’t the smoothest one. We weren’t quite convinced in the widely spread “Design is code, code is design” line. Sure, this brings different disciplines closer, but it doesn’t equate them. At least not yet. The whole rename .sketch extension to .zip, unzip it and then connect to GitHub (which we use) process does work (and you get to see the changes in the preview .png). But, for starters, it would be a lot easier if there was some sort of Sketch launcher that would eliminate the extension renaming process. It doesn’t seem possible to use branches in an effective way (they can’t be merged and all the integration work needs to be done manually) so we, designers can’t link our system with version control and as a consequence can’t have a good overview of the all the progress done on the design. Also, simply put, this is a great concept but we just don’t see a workflow where a developer might find himself changing design elements and checking that code back in so the Sketch app can render those changes next time we work on it. Recently we had the issue of multiple designers working on the same project. There were constant debates as to which file is the “freshest” and manual overriding to create one master file. It moved us to explore versioning systems we could use within our design team. Libraries, as we’ve seen with Craft, works well if you’re willing to create separate text styles, color and uncategorised layers that can then be used through multiple .sketch files. But, what if entire layouts and pages need to be changed and rearranged, not just styles and components. How do you update structure and flow? Symbols work great for single-player, single-file mode, libraries are more multi-player, multi-file kind of situation, but what about multi-player, single-file scenario? At what point and how do we unify our work and keep a neat overview of it? Developers already have tools like GitHub and Source Tree – we needed a similar version control system. Enter Folio, Plant and Abstract. Folio is a Mac only app that allows you to join existing Git repositories. You can clone existing projects from anywhere, including Gitlab, Github, Bitbucket or your own Git server. Folio will automatically stay in sync. Unlike the other apps it has no Sketch plugin and is available for free in trial mode through a Free Viewer. It works with most files (Photoshop, Illustrator, Sketch, Antetype & SVG out of the box) and you can add support for most files that have Quicklook previews. Folio makes it quite easy to add a Git repository and allows you to browse all files assets and work with them. When you update your Sketch file, Folio will automatically update (commit and push) it. It also keeps all versions of a file, so you can easily review them. However, it’s a bit messy since there is no folder organisation – just one library. Also, In Folio every commit you make is on a single file. Select a file on the left, show its version history on the right. 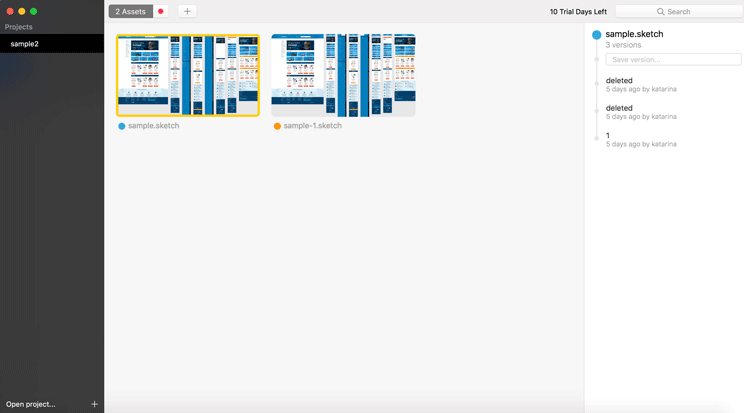 Other than your written description, the only way to see which components on which artboards were changed is to compare them visually. Plant is also a Mac only app with a Sketch plugin. It includes Cloud sync, version history, conflict resolution but seemingly you cannot use Plant with other version controlled softwares than the proprietary one (currently you get 1 GB). It’s based on pages (and has filtering options) – it recognises which artboards you made changes to and suggest them as changes ready to be sent. It has the ability to show only the modified artboards as well as comments to each version in a pretty neat preview mode of the artboard. It also syncs pretty fast. We only wish it was more clear as to what is the actual master file (since that’s our main goal). Right now, each version you change is listed in the history on the right and branching and merging is not as clear as we would like them to be. We have to give it up to Abstract as they seem to be our favourites. It took us no time to find our way around the app as it’s very clear what your commits and branches are as well as what the master file is. We had two questions for the crew that generously invited us to try out the Private Alpha – when can we buy Abstract and can we use our own GitHub (since that is what the company uses as a versioning tool) to clone projects and stay in sync. At the moment you can’t use Abstract with other version controlled softwares (i.e. Github and Bitbucket) than the proprietary one. We’re still waiting for a reply on if that would change. Currently it is available only for Mac and Sketch but it was announced that it would also be available for Adobe. As they put it on their blog “Throw Abstract in the mix, and suddenly everyone on a team has access to a rich history of why certain things are the way they are, the decisions that led to the current state of the work, and a way to instantly start contributing in a meaningful way.” Can’t wait for the Public Beta! I also have to give thanks where thanks is due – to the backend developer who helped create this article. Thanks for all the help and collaboration! 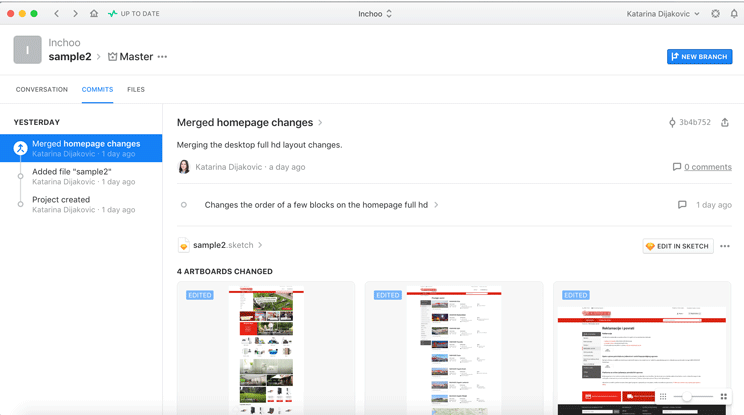 Thanks for the post, I am looking into design file versioning for our team and I am blown away by the fact that NO tool is available as of yet that facilitates versioning with a specified bitbucket repository, supports branches, makes artboards viewable and is able to merge sketch files per artboard. I really hope that Abstract catches up quickly to that as Folio is really unusable in a team context without branches and merging.